Testimonials | Effects | How to use | Reseller | BUY IT NOW! Neck Perfect™ Anti-Aging Neck Mask is formulated using our proprietary Anti-Aging Serum formula – Coupling the miraculous restorative qualities of natural ingredients and herbs such as red wine essence with modern bio dermal solutions such as collagen, elastin and enzyme extracts. Using the Neck Mask will boost moisture levels and increase elasticity around the dedicate layer of skin surrounding the neck, smoothing out dehydrated wrinkled skin. This will reverse the effects of neckfolds developed as a result of aging, as well as a preventive measure to keep your neck and jawline looking youthful always. Regular use of the Neck Perfect™ Anti-Aging Neck Mask will encourage constant skin regeneration and repair, keeping your neckline smooth, supple and resilient. Regular use of Neck Perfect Anti Aging neck mask will increase elasticity of the dedicate layer of skin surrounding the neck, thus reversing the effects of unsightly neckfolds. Neck Perfect Anti-aging Neck Mask tightens and firms the skin around the neck, reducing the effects of a loose and saggy neckline. Our anti-aging serum formula which contains restorative properties from ingredients like Resvetrol and Collagen can significantly reduce wrinkles and finelines with continual use. It also hydrates the skin, thus preventing the development of Wrinkles and finelines. Dry skin around the neck area is one of the main causes of the formation of unsightly necklines. Using the Neck Perfect Anti Aging neck mask will effectively boost moisture levels in the skin for up to five days after application. Therefore, directly preventing the formation of necklines as well as keeping your neck looking supple and youthful. Put the mask on the neck area for 10 to 15 minutes. Thereafter, remove the neck mask and rinse with water. For best result apply 1-2 times a week. Wash and cleanse your neck area thoroughly and dry the surface. Take out Neck Mask from pack and carefully apply it on your neck area. Keep the mask on for 10 to 15 minutes to allow Anti-Aging ingredient to be absorbed into the skin. Remove the Neck Mask and clean your neck area. You will feel that your neck feels more moisturized and supple. 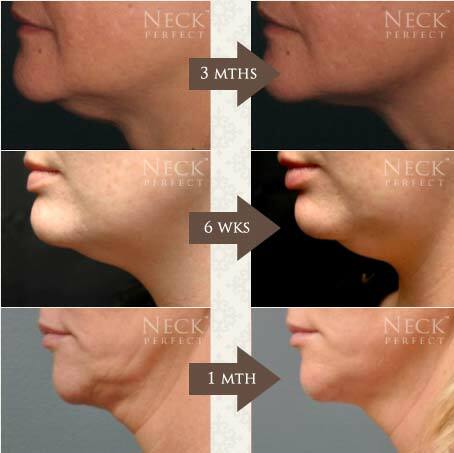 Use Neck Perfect™ Anti-Aging neck mask at least two times a week. After you are satisfied with the results, use Neck Perfect™ Anti-Aging neck mask once a week to maintain a smooth, supple and resilient neckline. Use Neck Perfect™ Anti-Aging Neck Mask once a week to encourage constant skin regeneration & repair, keeping your neckline smooth, supple and resilient. © Copyright 2019 Neckmask.com, All Rights Reserved.